We are waiting for your arrive! Our house is "Long Homestay GenTomo House" to live for with families of the world in the house where a Japanese couple lives in. Stay in our house for a long term and welcome the families who want to enjoy life looking like a family of the world. A housemaid does washing and cleaning twice every day, and our house is always kept beautifully. Hello to all my new families! 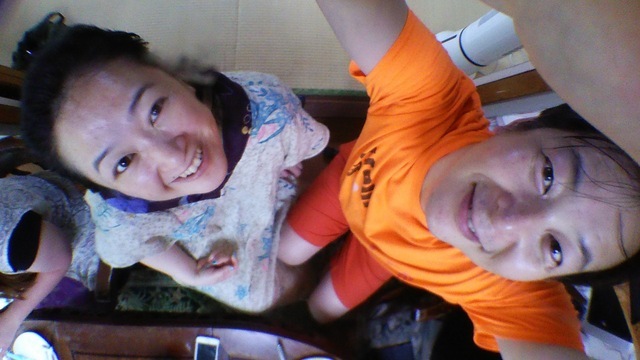 Our family accepts you as a family as [landlord residence type homestay (※３)] named "GenTomo house". With a stay of "One month (※ １), for half a year (※２) following”, I wish it is an opportunity of the learning in Japan while I live a life looking like we GenTomo and a family（※１）. We look forward to the encounter with the families who are looking for homestay in Tokyo of the world. ※：The permission from prefectural governors or the mayor or the head of a ward is necessary for an act to let a general tourist stay as the hotel business by the law called the hotel business method in Japan. In we long homestay GenTomo house, foreigners coming to Japan as a family of the homestay provide a place and an opportunity to learn Japanese culture. We report it to person in charge of Adachi, Tokyo public health center life board of health life hygiene Mr.Ugajin and, for it looks like a family, accepting foreigners as a homestay house on May 30, 2016, have authorization of the hotel business method exclusion by word of mouth. ※１：When it's a stay as "the landlord residence type home-stay", there are no minimums and legal regulations of the upper limit, but Mr. Ugajin in Adachi health center is doing the view to which he says the condition that a landlord and the family live in the same way is indispensable, and that a stay in more than 1 month is desirable. In other words, please come to stay in our house to become our family, and you are. ※２：It is the upper limit plan days of the law for the people stay「Minpaku」 in planned Japan established newly in the spring of 2017 "to be as follows for half a year". Please make sure to let us know the following details when you book. ※We do the intelligence that followed the rule of the Japanese hotel business method. I decline a stay beforehand when there is not reporting. The cancellation fee of that case follows an agreement. Please tell the next item as soon as a plan is fixed. ⑤The next destination after departure from GenTomo house. ・A full name, an address, the occupation of all the members who arrived. ・The confirmation of the passport and the copying of the passport. （The operation that followed the rule of the hotel business method. ・The reconfirmation of a house manual and the house rule. ・The actions that forgot to be the member of the family of the GenTomo house are prohibited. You take off the shoes in the entrance hall on the second floor, and please put it in the shoebox. Please carry away the toilet paper to the restroom after use. You wash the tableware which you used and wipe it, and please put it back. Please inquire into the washing by oneself. The room always keeps it neatly, and please tidy. Please always say hello well. 6.※(2nd floor, a 8-mat tatami room,futon ) Urgent correspondence. Thank you for visiting our page, and we look forward to seeing you. We won’t let you down by choosing our house since a lot of the families we had in the past left many positive comments. More than twice every day, a very cute housemaid is doing washing and cleaning in the sharing place where a hallway and stairs are kitchens, dinings, communication rooms, bathrooms and restrooms, etc.. You also make the room and the sheets very beautiful before your check-in. It's always kept beautifully thanks to the cleaning charge you bore. Please stay surely. There are 5 rooms and 1 parts of space prepared. Please use the room designated by the host. We will try our best to meet your request as much as possible, so let us know if you have any requests at booking. You can use the shared dining room,kitchen,a bathroom (toilet), and the shower (bath) room anytime. Please refrain from entering the host’s room ( on the 2nd floor, Enter at the entrance; and the front) without permission. When there’s any vacant rooms on the 2nd floor, you can use it with other families, a terrace on the 4th floor (50㎡) is also available to share. ※We might need to ask you to change your room during your stay due to the booking system, so please keep that in mind. Because we want to support travelers in Japan, we offer very friendly price. Children under 6 & baby will be counted as 1 adult for 2, and free for 1 child & baby.. The house also owns very precious furniture, so please treat them kindly. Have a good time, and we look forward to seeing you. Feel free to use the hallway, stairs, kitchen, dining room, bathrooms, washing machine, the veranda and the rooftop. Your room might be entered by the host or housecleaner. However, you have the responsibility tidying up the space that you use.Please keep your belongings neatly. There’s 50㎡ balcony on the rooftop, you can smoking and sunbathing, BBQ are possible, and please use it neatly calmly. We enjoy talking to our guests when we’re at home, so feel free to have a chat with us! We usually invite all the guests to join our morning juice serving time to help you to make friends with other guests. You’re also very welcome to enjoy chatting with the people in the shared space at night. We’ll feel very glad once this house becomes your second home in Tokyo. We hope our families to strike up conversations with one another. To get the ball rolling, greeting is a good way to have a smooth start. Since you are / will be in Japan, let's try saying some greeting phrases in Japanese. If you are Japanese, let's try using English when you speak to guests from other countries. Say ‘Tadaima! / I'm home!' when you get home or check in. Say ‘Okaeri! / Welcome home!' when you hear someone get home. Say ‘Ittekimasu!' when you leave or check out. Say ‘Itterasshai!' when you hear someone leave. As an opportunity for families to make friends with one another, we often offer freshly cold-pressed juice in the morning. The serving time can be changed depends on the day, but we usually ask all the guests to get together about 9:00. The breakfast for us is this fresh juice. And you can treat other families to fresh juice with give love. Say ‘Kanpai! Itadakimasu!’ which means ‘Cheers! Thank you for the drink!’ in English to start drinking. After enjoying it, let’s say ‘Gochisousamadeshita!’ to share the happiness and smiles with everyone. At night, It is greatly welcome to have a drink and chat with other families in the living or dining room. A wide range of alcohol is available in the fridge with \200 per can if you feel like drinking. The kitchen is 24h open, so please feel free to prepare snacks or light meals voluntarily to enjoy with other people. Such active attitude of yours will make us very happy as a host. You welcome that you treat other families to the dish of your hometown. As I establish " Ataeaibako; love-giving box " for exclusive use of the dinner, if you to cook, please receive a material cost from there. The families who was treated for the next families for exclusive use of the dinner " Ataeaibako; love-giving box " using 1,000 yen as an indication. If you are lucky, you might get to enjoy our home-made healthy meals. Please feel free to join us when we invite you to such opportunities. We will be glad to share with you. Basically, 9 o’clock AM and 3 o’clock PM, we ask a house cleaner doing the laundry and cleaning the house. When you see her while staying with us, please say ‘Itsumo Arigatou!’ to make her happy and keep this house in even more happiness. Our standard check-in time is 5 pm (Japan time of course. Haha), but we can be flexible with it. In case of when you join in another families room, you can bring and keep your baggage in the hallway on the day you check-in, but you can’t enter your room earlier than 3pm. For late check-in, I cope with adaptation to circumstances. Please come in peace. Please make sure to let us know your anticipated check-in time when you make a reservation. If any change occurs, please also notify us; otherwise we will be worried about you. ※Give love method is the present from a past guest for the service that oneself receives, it is free. I say money for you to present it to a future guest. I recommend that you who are a guest treat other guests to a lunch and dinner. In that case, you can receive ingredients costs from Give love box. After taking the east exit of Takenotsuka Station, you’ll be welcome by a lively shopping arcade. In our neighborhood, there are lots of restaurants, so you won’t be in trouble with finding eating places. Exploring this area can be a nice blast as well as sight-seeing in Tokyo. There’s a shopping mall called Ito-Youkadou by our house, and it’s very convenient to get some food and other daily stuff. Also. some restaurants in the shopping arcade open til early morning. It is the ticket of the special JR train for exclusive use of the foreigner very cheaply. After you arrived at Japan, I cannot buy it. You must consider before your trip. The Japan Rail Pass has extra charge green car use and two kinds for the common car, and they are divided into the pass for 21 days more on 14th for seven days. About the coverage of each pass, look at coverage of the Japan Rail Pass. From each station of the Tobu Line to the Tokyo downtown area! A ticket of the getting on and off freedom in the Tokyo Metro Line is advantageous with a set! A round-trip ticket between departure station (Takenotsuka Station) - Kitasenju. ※You can get on and off Kitasenju - Asakusa interval, Hikifune - Oshiage interval, the Tokyo Metro whole line freely.Tokyo Metro whole-day pass. Nearest JR & Tokyo Metro Station, Kita-Senju Station. It is ten minutes by a train from Takenotsuka Station to Kita-Senju Station. It is convenient to change to subway Hanzomon Line direct communication high speed and high speed for Asakusa at neighboring station, Nishi-Arai Station. As it is the same platform opposite side, stairs movement is unnecessary. A lot of our guests got impressed and said many of the major touristy spots in Tokyo can be reached conveniently from Takenotsuka. Trains often start from that station, it’s actually easy to get a seat on a train, too! Tobu Skytree Line is connected to Tokyo Metro Hibiya Line directly, so you can enjoy the journey on the train by sitting confortably. Tobu Sky Tree line (Tobu Isesaki Line) Takenotsuka Station is the closest station from our house. It is 8-minute-walk distance, but taking a taxi is recommended when there is much baggage. It costs \730/ taximeter. That train line is directly connected to the subway, and you can go to many touristy spots in Tokyo by transiting once or even without it. Also, it only requires one transit from Haneda / Narita Airport, Shinagawa / Tokyo / Ueno Station. In addition to those, there are a lot of other tourist attractions that can be easily accessed, such as Tobudobutsukoemmae, Kitasenju, the Tokyo Skytree, Asakusa and Shibuya. Here’s the best place for sightseeing in Tokyo or enjoying Tokyo’s downtown area called Takenotsuka. Cancellation : A case more than one week ago is at half price from a day of the check-in. Less than one week is the total amount. But for up to one month. What to see & do : Sensouji,Tokyo skytree,Nishiarai-taishi,Ueno-park,Ameya-yokocho,Akihabara electric town,tsukiji fish market,and so on.